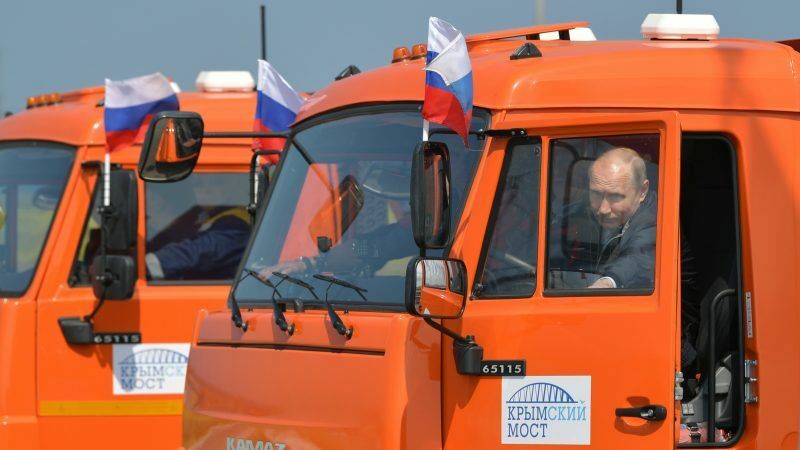 President Vladimir Putin drew condemnation from the US, Europe and Ukraine on Tuesday (15 May) after he opened a new bridge linking mainland Russia and Moscow-annexed Crimea by driving a truck across it to the peninsula. Putin dressed in jeans and a casual jacket was shown by Russian state television behind the wheel of a construction truck to drive 19 kilometres across the bridge, which links the Taman peninsula in southern Russia to Ukraine’s Crimea, which was annexed by Moscow in 2014. “I want to sincerely congratulate you with this remarkable, festive and, in the full sense of the word, historic day,” Putin told workers upon arrival on the Crimean side of the bridge. “In different historical eras, even under the tsar, people were dreaming of building this bridge,” Putin told cheering workers. He was referring to Russia’s last tsar, Nicholas II, who first proposed such a bridge, but the outbreak of World War I prevented it going ahead. Another unsuccessful attempt was made in the 1930s under Joseph Stalin. During World War II the occupying Nazis also began building a bridge but abandoned the project. Putin, who was re-elected for a fourth Kremlin term in March extending his long rule, pledged to build more of “such projects” across Russia. The Crimean Bridge overtakes Lisbon’s Vasco da Gama Bridge as the longest in Europe. Built at a cost of 228 billion rubles (€3.13 billion), the new structure connects the southern Krasnodar region with the Crimean city of Kerch, spanning a strait between the Black and Azov seas. Ukraine, which along with most of the international community has not recognised Russia’s annexation of Crimea, condemned the project. “The Russian occupying powers, which have temporarily occupied Crimea, are continuing to act outside international law,” Ukrainian Prime Minister Volodymyr Groysman told AFP in an interview. Ukraine has also previously complained that the construction has damaged the environment and that larger ships will be unable to get through to its ports on the Azov Sea. The United States said the bridge opening was an attempt to solidify Moscow’s “unlawful seizure” of the Ukrainian territory. “Russia’s construction of the bridge serves as a reminder of Russia’s ongoing willingness to flout international law,” State Department spokeswoman Heather Nauert said. The European Union also criticised what it called a fresh assault on Ukraine’s territorial integrity. “This constitutes another violation of Ukraine’s sovereignty and territorial integrity by Russia,” said a statement by a spokesperson for the office of the European Union’s foreign policy service. British Foreign Office minister Alan Duncan said it was “a further example of Russia’s reckless behaviour”. Meanwhile, Ukraine’s security service raided the offices of Russian state media in Kiev and detained one local journalist on suspicions of treason, moves the chief editor of Russia’s RT television suggested were linked to the bridge opening. The chief editor of the Kremlin-funded channel, Margarita Simonyan, wrote on Twitter that “Kiev decided to take revenge on us for the Crimean Bridge,” after the raids on the offices of RIA Novosti state news agency, which is part of the same media group as RT. European Union and US sanctions have targeted those involved in building the bridge, principally Putin’s close ally, businessman Arkady Rotenberg, whose company Stroygazmontazh won the construction contract. The annexation of the peninsula in 2014 was condemned by Kyiv and the West as an illegal land grab but applauded in Russia. The peninsula has been hard to reach from southern Russia with long queues of vehicles often forming to board ferries, which cannot always run in winter storms, so the easiest way across is to fly. Because of blocks imposed by Kyiv, in addition to Western sanctions, a large amount of food is currently shipped to the peninsula from Russia, so the bridge will play an important role in reducing the region’s reliance on sea transport. The four-lane road bridge is opening ahead of schedule as it was due to be completed in December. Once it opens for traffic on Wednesday, it will be able to carry up to 40,000 cars per day. A railway bridge is not yet finished and has a deadline of the end of 2019. A connecting highway from Kerch to the regional capital of Simferopol is set for completion in 2020.